MoreAt Hannula Halom & Scherz Attorneys in Superior, Wisconsin, we are a full-service law firm that has been solving our clients' legal problems in such diverse areas as personal injury, workers' compensation, divorce, custody, estate planning and real estate for over 35 years. All of our attorneys live here in northern Wisconsin, and we know our communities well. Whether from Superior, Washburn, Ashland, Bayfield, Douglas County or anywhere in Wisconsin and Minnesota, our clients know they can...At Hannula Halom & Scherz Attorneys in Superior, Wisconsin, we are a full-service law firm that has been solving our clients' legal problems in such diverse areas as personal injury, workers' compensation, divorce, custody, estate planning and real estate for over 35 years. All of our attorneys live here in northern Wisconsin, and we know our communities well. Whether from Superior, Washburn, Ashland, Bayfield, Douglas County or anywhere in Wisconsin and Minnesota, our clients know they can count on us. Daniel Hannula is known as an outstanding trial attorney. He serves on the board of directors and the executive committee of the Wisconsin Association for Justice and is also a member of the Wisconsin Bar Association. He has taught trial practice classes for the Wisconsin Association for Justice and the American Law Institute. Gary Halom focuses primarily in the area of civil trial law. He has represented hundreds of clients in claims against insurance companies, employers, negligent drivers and at-fault property owners. He is a member of the Douglas County Bar Association, the Wisconsin Bar Association and the Wisconsin Association for Justice. Ryan Scherz represents clients involved in condemnation litigation, handling claims involving the Department of Transportation, the Bureau of Aeronautics and high voltage transmission lines. He is a member of the Wisconsin Bar Association and the Wisconsin Association for Justice. Kevin Van Ert focuses on family law litigation and estate planning. He is a member of the Douglas County Bar Association, the Wisconsin Association for Justice and the Superior Young Professionals. 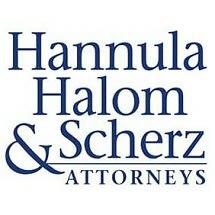 Hannula Halom & Scherz Attorneys offers free initial consultations and accepts credit cards. Whatever our clients' needs, our law firm stands ready, willing and able to guide them through the complexities of laws, regulations, procedures, etc. We pride ourselves on being problem-solvers.